You’re probably already familiar with virtual reality, strapping on a headset and interacting with a different world has been the dream of futurists for years. On the other hand, augmented reality is achieved by combining the “real world” with additional content. Think of heads up displays now common in many new car models, or apps that let you virtually paint different rooms of your house. Every way you look, companies are finding new areas to complement your everyday life. You’re not “going” anywhere. You’re right there, just with more going on. According to Digi-Capital, the AR/VR industry could reach as much as $150bn by 2020. With over $120bn solely in AR, the platform is estimated to dominate VR ($30bn). Currently there are over 1000 startups devoted to augmented reality on Angelist, and 450 devoted solely to VR. Taking notice are the behemoths of Silicon Valley. Long before the summer of AR game Pokemon Go, companies like Facebook, Microsoft, Google, and Apple were already funding their own AR and VR projects. At Apple, new investments in the AR platform give indications that the company is banking on the platform. As sales flag on every consecutive iPhone model, the company has serious motivation to take on new lines of business, both in hardware and software. It’s hard to argue with the awe-inspiring possibilities, especially after taking a cruise around the website of leading VR startup Magic Leap. Integrating constructed content (audio and visual) into the viewer’s reality gives rise to an entire new scape for advertising and messaging. While the marketer in me thinks immediately of e-commerce opportunities, the kid in me is awe struck by the reel of a humpback whale breaching through a gymnasium floor. The inept adult in me also excited about having information like nutritional facts, travel directions, or even the weather integrated into my everyday life. 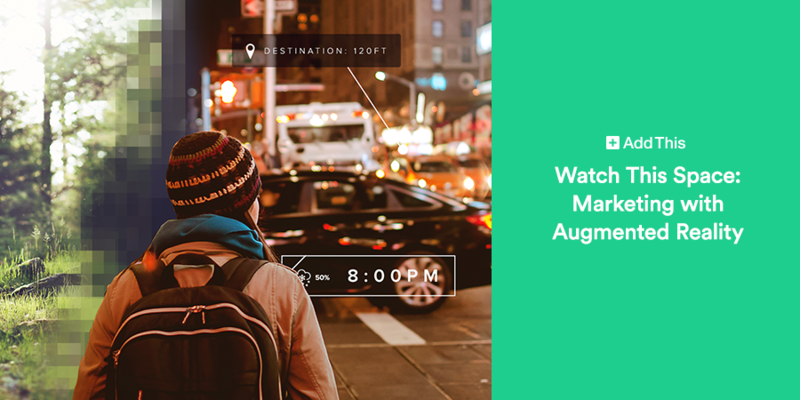 Whether it’s personalizing marketing content within wearable tech, or inserting moments of delight into customer experiences, augmented reality can bridge the gap between your real life offering and created content. Imagine shooting fireworks around a customer after a conversion moment, or advertising a waterproof jacket next to a rainy window. The possibilities are as limitless as our imaginations, which is ripe fruit for marketers.